Hands on with the Samsung Galaxy Tab 8.9 – our new favorite tablet? It’s only been since yesterday, but I feel like I’ve made a new friend. 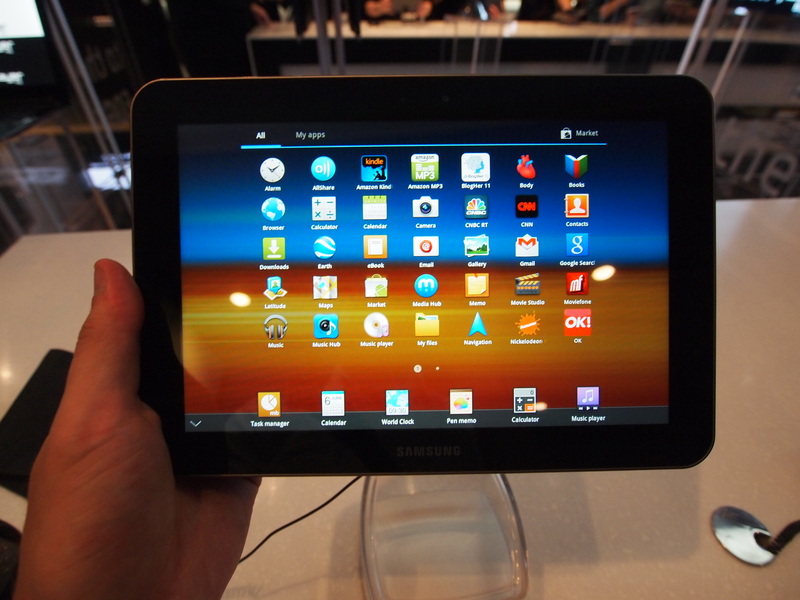 Last night, Samsung re-revealed its Galaxy Tab 8.9, a slightly smaller companion to the Galaxy Tab 10.1 (review). This tablet was originally shown at CTIA in March and was supposed to debut in June, but things change and now it will be hitting shelves Oct. 2 here in the States. At CTIA, we were not impressed with UI of the tablets: they looked good but ran slowly. Since then, Samsung has been hard at work improving the user experience and its hard work has paid off. Samsung’s new TouchWiz interface is the first decent modification of Android 3.1 (Honeycomb) we’ve seen. The Korean manufacturer has redone all of the artwork and remade Honeycomb without the techno fonts and Tron-like color scheme. The result is pretty impressive, though there are a few holes where Google’s Android UI pokes through (like the unlock screen). Hopefully Samsung will plug these small design inconsistencies. We were critical about Samsung’s Newspaper-like blocky widgets back at CTIA as well, but they’ve been smoothed over, given the ability to resize by Android 3.1, and most of them now look relatively useful and put together. In some ways, this new interface almost combats Windows 8 before it hits shelves next year. It too, will have a page full of square and rectangle widgets (called Live Tiles). Samsung’s widgets aren’t as sophisticated or thematically consistent as Live Tiles, but maybe with time we’ll see more of them. The mini-mode tray is another example of an innovative idea. By pressing on an icon in the task bar, you can bring up a menu of six small widget apps: a world clock, calendar, task manager, pen drawing app, calculator, and music player. Clicking on any of these apps will bring up a small windowed widget-app that looks pretty slick. Unlike at CTIA, these apps are now movable and you can exit them or make them full screen with the touch of a button. The only downside is that the tray is not customizeable. Because Samsung modified Android to make these widget-apps happen, there are only six of them. No apps from the Android Market will be able to take advantage of this fun innovation unless Google includes it in the next version of Android. Until now, all Android tablets have either had 10.1-inch or 7-inch screens. Our problem is that 7 inches feels too small and 10.1 inches sometimes feels too wide (Android tablets run in widescreen). Samsung’s 8.9-inch Galaxy Tab gets us closer to that sweet spot. It still has the resolution of the 10.1-inch Galaxy Tab (1280×800) and runs on similar dual-core specs, but it’s just small enough so that many more people will be able to thumb-type on it in landscape without trouble. It’s a nice wish to be able to type with all of our fingers, but until there’s a 13- to 15-inch tablet on the market, it isn’t going to be feasible. Thumb typing is the next best thing and the Galaxy Tab’s modified keyboard does a fine job of it. The size means nothing if the hardware isn’t up to snuff, but Samsung has stuck with the design style of the Galaxy Tab 10.1, meaning this tablet is one of the thinnest, lightest, most comfortable tablets on the market. It weighs less than a pound and is a scant 8.6mm thick. The power button is easy to find and the speakers have been smartly relocated to the bottom of the tablet (they were right where your hands hold the sides of the unit). Supposedly, it also packs some good battery life, but we’ll find that out in time. The Galaxy Tab 8.9 comes out Oct. 2 and is now available for pre-order. It will cost $469 for the 16GB model and up. Sadly, the price is the only thing that may hold it back. That and Apple’s constant lawsuits. We can see why the folks in Cuppertino would be nervous, however. Samsung’s tablets are impressive. We’ll have a full review soon.